Dry/Wet Ratio & Tone Of Central Sources For Different XY Mutual Angles: For the following three audio examples I replayed a small snippet of the BBC shipping forecast through a loudspeaker at the centre of the soundstage, and recorded it in stereo with three different crossed cardioid pairs. The microphones were all Avantone CK1 small-diaphragm condenser mics, so the only variable in these tests was the mutual angle between the mics in each case: 90 degrees (Ex08.01:WAV/MP3 ); 110 degrees (Ex08.02:WAV/MP3 ), and 140 degrees (Ex08.03:WAV/MP3 ) respectively -- figures that will be familiar to anyone who's perused Tables 8.1 and 8.3 in the book! There are two specific things to notice: firstly, that the relative dry level of the centrally located source reduces as the mutual angle increases, making it appear more distant; and secondly that the tone of the voice becomes noticeably duller with increasing mutual angle, on account of the source moving progressively further off-axis to the mics. AB Stereo Miking Comparisons: With spaced stereo techniques, the spacing between the mics determines the array's acceptance angle, and hence the apparent stereo spread of the captured instrument, as you can hear by comparing these AB classical-style recordings of a grand piano taken from in front of the instrument, with the mics positioned just below the angle of the open lid at a distance of around 2.2m. In the first excerpt (Ex08.05:WAV/MP3 ), the small-diaphragm microphones were only spaced roughly 40cm apart, whereas in the second snippet (Ex08.06:WAV/MP3 ) the distance between them was more like a metre. It's also interesting to compare the sound of the wider-spaced pair when its omni capsules are replaced with cardioids (Ex08.07:WAV/MP3 ) -- notice that the presentation is considerably drier and more restricted at the low end of the spectrum, as you'd expect, but that the stereo imaging is nonetheless very comparable. Printable Stereo Protractor: Here's a PDF document you can print out to help you setting up stereo-pair mutual angles more accurately. For reference, I've also indicated on it the suggested mutual angles given in Table 8.1 of the book. Origami Mutual-angle & Mic-spacing Templates: It's possible to fold a mutual-angle template for any angle up to 160 degrees (increments of 5 degrees, accuracy +/-1 degree) from a piece of A4 paper -- this PDF document shows you how. Note that, although I've included the ‑30/‑60 and ‑20/‑70 folds for the sake of completeness, I rarely bother with them -- the ‑35, ‑45, and ‑55 folds on their own already allow angle templates for 70, 80, 90, 100, 110, 125, 135, and 145 degrees (as well as various smaller angles by halving), which gets you within 5 degrees of any of the suggested mutual angles in Table 8.1. Origami mic-spacing templates are also easy to create, given that A4 paper measures roughly 20cmx30cm, and these dimensions are easily halved/quartered to 5cm, 10cm, and 15cm. Camera-protractor Apps For Stereo Miking Setup: Another option for judging stereo miking angles if you've got your mobile device on you is any app that provides a 'bomb-sight' mode with on-screen angle measurement, such as the dedicated Stereo Mic Tools from Apple's App Store or more general-purpose freeware utilities such as On Protractor from Google's Play Store. Affordable Stereo Bars: The K&M 23550 and 23510 short stereo bars are both affordable and good-quality, but if you're after something longer and more elaborate (with mutual-angle and spacing markers), check out Superlux's relatively affordable MA90. Low-frequency Shuffling Implementations: There are several ways to implement the low-frequency shuffling technique mentioned in the book, the simplest being to use one of those increasingly common MS-enabled EQ plug-ins to dial in 3-6dB of low-frequency shelving boost in the sub-500Hz region of the Sides channel. However, if you're trying to implement this kind of processing from first principles, this PDF document gives a couple of block diagrams of specific implementations to get you started. Freeware MS-Encoder/Decoder & Vectorscope Plug-ins: For MS encoding and decoding (as well as simple MS rebalancing) in a software DAW, you need look no further than Voxengo's excellent cross-platform freeware MSED plug-in -- a utility that I use on a daily basis. There's also a couple of great cross-platform freeware vectorscope plug-ins available if you're struggling to judge stereo width over headphones or under compromised monitoring conditions: Flux's StereoTool & Melda's MStereoScope . Stereo Array Calculators: If you want further help designing a stereo microphone array for a specific session, here are a few of the most useful resources: my personal favourite is Helmut Wittek's Stereo Image Assistant (although it requires the latest version of Java to run, and it's worthwhile reading Wittek & Theile's 'The Recording Angle -- Based On Localisation Curves' if you want to get the best out of it); Eberhard Sengiel's web-based stereo-array visualisation page; and Michael Williams's well-known 'Stereophonic Zoom' article from Rycote's Microphone Data site. Creating Click Tracks: The Sound On Sound magazine archive has a great article about this from drummer Gavin Harrison: 'Creating Click Tracks For Drummers'. Equivalent XY & MS Stereo Arrays: For more theoretical and practical information on the degree of correspondence between XY and MS stereo coincident arrays, I'd recommend casting an eye over Dooley & Streicher's 'MS Stereo: A Powerful Technique For Working In Stereo' and Trevor DeClercq's 'A More Realistic View Of Mid/Side Stereophony'. The OSS (Jecklin Disk) Baffled-stereo Method: If you fancy experimenting with this, there's a translation of Juerg Jecklin's original 1980's 'Microfon Aufnahme Systeme' paper on the Josephson Microphones website, although you'll have to be a German-speaker to read his more up-to-date offerings on the subject of microphone technique. 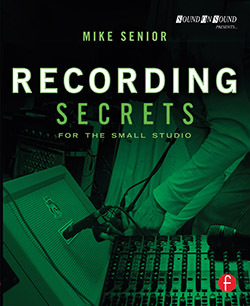 Surround-sound Mic Techniques: Those determined to investigate the subject of surround-sound microphone technique should try John Eargle's The Microphone Book in the first intance, as this gives a thorough technical background, as well as various case-studies backed up by audio examples from the author's own commercial releases. If that's not enough to put you off then there's plenty more to chew on in Helmut Wittek's excellent publications archive, Michael Williams's 'Multichannel Microphone Array Design' article from the Rycote Microphone Data web site (and his own MMAD site), and Eberhard Sengpiel's enormous article library.